Gallochoille pier on the small island of Gigha is used by local fishermen. 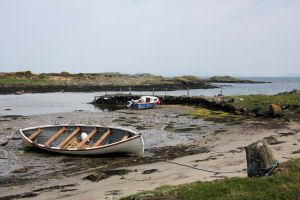 The Island of Gigha is the southernmost island of the Inner Hebrides, it lies between Islay and Kintyre and can be accessed by ferry from Taylinloan on Kintyre. Because it is low lying and influenced by the North Atlantic Drift the climate is drier and warmer than that normally associated with the west coast of Scotland.